The articles themselves are 2 4 pages in length, written in minimally technical language, an engaging tone, and comprehensive enough to address most common concerns (use of particular techniques, methods, or materials) without becoming a laboratory manual or overly dense reference card. … This book should be seen as a reference to be read under non-emergency situations by working professionals, supervisors, and pre-service faculty. Teachers who are looking for a resource to help them navigate the challenges of maintaining a safe science classroom would find this to be a very helpful book. This text provides a toolkit to help teachers insure that their classroom is a safe one. The book is designed to be a handy reference that can be accessed whenever a question or situation arises regarding safety in the classroom. ... This latest edition to the Safer Science collection will help any secondary teacher insure that they are providing the safest environment possible for themselves and their students. This resource successfully delivers as a practical reference for connecting laboratory activities with a safer environment. 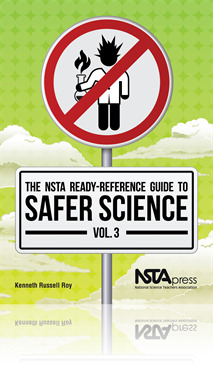 The three-volume NSTA Ready-Reference Guide to Safer Science Series includes NSTA Ready-Reference Guide to Safer Science, Volume 1; NSTA Ready-Reference Guide to Safer Science, Volume 2; and NSTA Ready-Reference Guide to Safer Science, Volume 3. Buy all three volumes together and save!